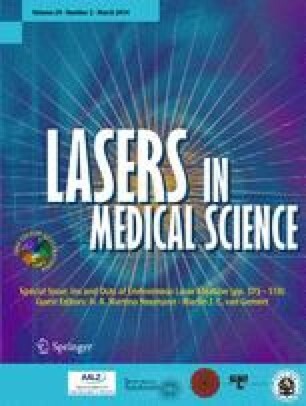 The purpose of this study was to assess the effect of 810-nm (DMC Equipamentos, Sao Carlos, Brazil) continuous wave low-level laser therapy (LLLT) on the pain caused by orthodontic elastomeric separators. Thirty-seven orthodontic patients (12 male and 25 female, aged 11–32 years, mean age = 24.97 years) participated in the study, including 20 subjects aged 18 years or more, and 17 under 18 years of age. Four elastomeric separators (Dentarum, Springen, Germany) were placed for the first permanent molars (distal and mesial), either for maxillary (22 patients) or mandibular (15 patients) arches; one quadrant was randomly selected and used as a placebo group (received no laser irradiation). After separator placement for each quadrant, patients received 10 doses (2 J/cm2, 100 mW, 20 s) of laser irradiation on the buccal side (at the cervical third of the roots), for distal and mesial of the second premolars and first permanent molars, as well as distal of second permanent molars (five doses). The same procedure was repeated for the lingual or palatal side (five doses). After 24 h, patients returned to the clinic and received another 10 doses of laser irradiation on the same quadrant. Postseparation pain level recorded on a 10-cm visual analog scale for both jaws immediately (hour 0), and after 6, 24, 30 h, as well as on days 3, 4, 5, 6, and 7. Significant differences in the pain perception (PP) were found between the laser and placebo groups at 6, 24, 30 h, and day 3 of the experiment (P < 0.05). Friedman’s test of multiple comparisons revealed significant differences in the PP among various time intervals for laser (chi-square = 173.407, P = 0.000) and placebo (chi-square = 184.712, P = 0.000) groups. In both groups, pain was highest at 6 and 30 h after placing elastomeric separators. No gender differences were observed in both groups. More pain was recorded in the mandible (P < 0.05) at 24 (laser group) and 30 h (both groups) after starting the experiment. The PP was significantly higher (P < 0.05) for the group aged 18 years or more, only at days 3 [both groups] and 4 [laser group only] of the experiment. The 810-nm continuous wave LLLT significantly reduced the PP in the first 3 days after orthodontic separation. However, the mean postseparation PP in both groups was low and wide ranges of PP scores were observed. The present research has been approved and funded by the Directory of Research, Iranian Center for Dental Research, School of Dentistry, Shahid Beheshti University of Medical Sciences (grant no. 7956). Dr Borzabadi-Farahani was supported by a research grant from the European Orthodontic Society and a Postdoctoral Research Fellowship from the Children’s Hospital Los Angeles.